Bench works as table under front windows when not in use. Constructed of solid pint, this Dining Bench features a beautifultraditional design. The rustic and distressed finish provides aunique vintage look that you will be sure to love. Seats 2 people. Dimensions 49.0 In. X 13.0 In. X 18.0 In. Looks prettier and fancier in person than in the photos online. 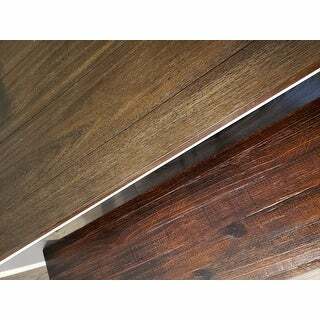 It is actual wood, so it's textured, may be a little rough in some parts of the furniture, and the color can vary. I absolutely love the look. Completely tranformed our dining room. I bought this bench to go with the Valerie 63-inch Solid Wood Dining Table for a farmhouse look. 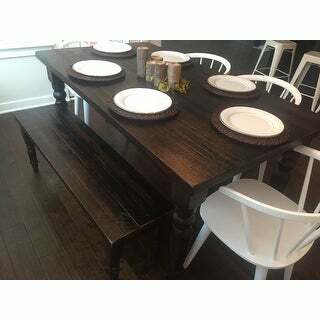 I love the bench and dining set and have gotten many compliments. 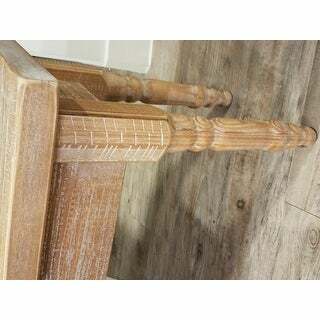 Made in Brazil, very sturdy construction and beautiful smooth finish although has a rustic appearance. I chose to use only the benches so they could store underneath and would not take up space in my small dining room. Love this table! 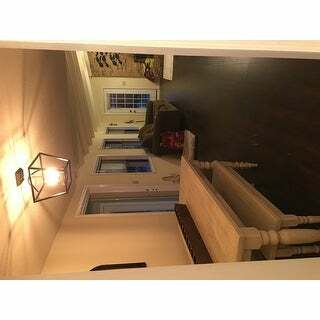 I paired it with an Overstock chandelier "Vineyard 6-ligh Metal and Wood Chandalier" that is also fabulous! 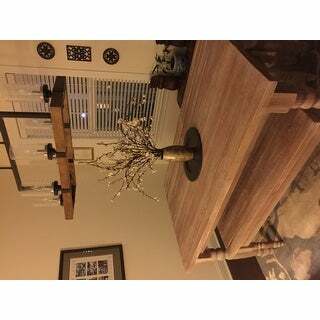 I am in love with this table,the Barnwood color is amazing!It is a darker color but not black there are various color shades to the wood..Ordered the matching benches to go with it and its just perfect.You could go from farmhouse rustic to industrial,easily transitional.The table and the benches are very good quality pieces of furniture.Some parts are a little raised or not as smooth but it is described as a rustic piece of furniture. 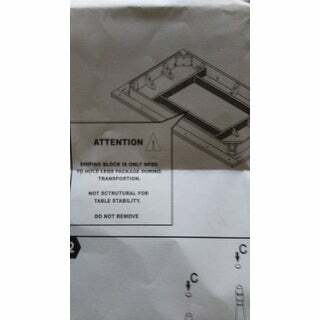 Before my purchase I read some of the reviews that said the table arrived with broken pieces underneath,it is not broken,that is actually a temporary brace to keep the table legs in place during shipping.I thought mine was broken too until I read the instructions and part description.It says clearly that's a temporary brace,the two wedge shaped pieces that I found floating around my box came from that brace.See photo. Assembly,the instructions said not to use a power tool.Realy?So I took the little allen wrench and began to put the first table leg on.I got halfway into tightening the first screw,it was getting harder to turn,my hand was hurting.These are long screws too and I knew that I had 23 more to go.So I grabbed my drill and a bit and was done with assembly in about 30 minutes.My drill is small so it fit into those tight spaces.I cant imagine tightening all those screws by hand.Just take your time and don't drill too fast as you might damage the wood. The table and benches arrived in less than a week in secure packaging.I am very pleased with my purchase. 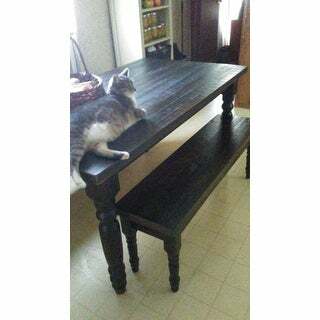 Bought along with Grain Wood Solid wood table as seating. Matches perfectly. Is sturdy and solid, but not too heavy. very pleased with this bench as part of the dining set. Soooo happy I was able to add two benches to my matching table! They are perfect! Nice and sturdy too! Highly recommend the Valerie table and benches! The finish was a little off but overall really solid and nice. Perfect for my dining ares. This bench is the perfect addition to the table with several chairs added around the table. The bench is wide enough to be comfortable, and is solid. Love the bench and the dining table together. I was looking for a barn style bench to match my dining room table. This bench has a great finish, is very sturdy, can easily fit 3 people seating. It is easy to assemble (just screw the legs in and you are good to go. I highly recommend. This is more of a cream than antique white. It’s still nice and seems to be sturdy. It took a little work to line up the holes for the screws. Really nice bench. Easy to put together. It also matches the table perfectly. I got both the table and the bench in the driftwood and I love them both. I absolutely love this bend! It adds a rustic/farmhouse appeal to my home. Very sturdy and great quality. I receive many compliments! I urge buyers not to hesitate! You won’t be disappointed! Great looking bench that goes perfectly with our dining room table. Fits two adults comfortable or three children. Very happy with our purchase! This is a beautiful set! It is heavy and attractive. The finish is "different"and almost feels "plastic", but it is heavy and solid and says it's wood so I'm sure it is. Benches slide under the table all the way so it doesn't take up a lot of space if you have a tight spot. This table is beautiful and sturdy! "I would like parson chair to go with this, do you have any recommendations? I am ordering the grain wood furniture valerie solid wood in gray." 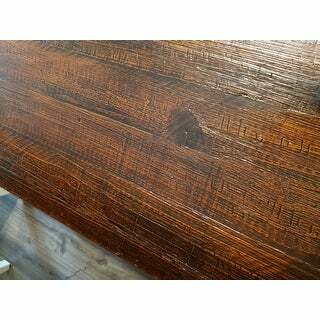 "I have a square dinning table of reclaimed wood in different tones (mostly light wood colored) and I’m looking for a couple of benches and 4 chairs to go with it. I like this bench, do you have a matching chair? I think if I get chairs in different wood finish and style then the bench it may look weird and they already won’t match the table exactly. Do you have a chair you recommend? And are both in stock for immediate purchase/ delivery ? Thank you! :-)"
"your Valerie grain wood furniture cites colors driftwood and barnwood, for the bench the barnwood is lighter and th table the driftwood is lighter. The colors are switched, one right and one wrong, but which. In eed an answer before ordering. i tried phone customer service who informed me this was the only way to get the correct information. Please reply. Maggie"
The driftwood color is MUCH lighter than the barnwood color. "is the Valerie solid wood dining table shown with the bench available?" I bought both in Barnwood color. You have to purchase each item separately. "Are you sure this is the correct measurement? Measures 18 inches high x 13 inches wide x 49 inches long. Because 13 inches wide seems off for a table." 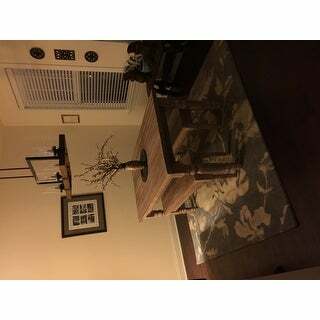 This is the matching bench, not the dining table and the dimensions are correct for the bench. "I'm getting the matching table in barn wood and some chairs that are off white, with 2 woven end chairs, which color bench would you recommend with this combination?" Since you are mixing and matching your pieces you have a couple of options- the driftwood or the off white option would likely work best. "Can you use this table outside?" Unless you have a covered patio where it wouldn't get wet at all....otherwise no don't put it outside.